Perhaps the biggest surprise and what sets CNC apart from other rockabilly, psychobilly and raw alt-country rebels, is the prominence of finger-picked guitar work. Most of the eight tracks are reliant on some great dexterity to give them heart. The noiser aspects of the band’s core sound are superb, but it’s those more intricate elements that make the tunes really stand. Never more was this more obvious than during the opening track ‘Kids’ll Lose Their Heads Sometimes’, a ripping country workout where the featured guitar work is tremendous, lending an almost road-weary bluegrass stance that paves the way for some more raucous electric riffage – a coming together of folk traditions and garage rock volume. Somewhere in the middle of it all, a slightly husky voice delivers the narrative…and by the time everything settles in and gang vocals give various cries and interjections, the feeling of energy is immense. If you don’t get some kind of emotional response from this even in the slightest way – if the raw sounds don’t move you – switch off, give up, choose something else – there’ll be nothing more for you here. The finger-picked blues of ‘Hell ‘n’ Back’ shows CNC at their most accessible, as a solid drum line pounds out a rhythm that’s somewhere between a rockabilly number from the 50s and an old country two-step, over which some timeless, twangy guitar adds a very melodic tune. As before, the finger-picking is crucial to any musical distinctiveness and absolutely refuses to die down, even by the time the duo reach a fit of anger through a distorted electric sound closer to garage rock. Hearing this for the first time is almost like imagining the works of Detroit Rebellion retooled for an extreme alt-country audience. It takes various influences – almost all of which are older than rock music itself – and creates something brilliant with the spoils. Equally enjoyable, ‘No Sleep At Motel Hell’ is a rousing, fairly lo-fi tune that blends even more American moods. The tales of woe within may have been heard many a time, but with everything swamped in distortion – save for a honky-tonk guitar – the performance is killer, almost like experiencing a country-obsessed take on The Cramps. ‘Chokin On a Mouthful of Lousiana Dirt’ chugs with a rough guitar sound, drenched in even more reverb. This provides the ultimate in dark and spooky backdrops, perfect for the tale in hand. Muted guitar notes meet a heavy bass drum, while a melodic picking adds melody, but it’s the vocal that leaves an indelible impression, landing somewhere between a Springsteen growl and Steve Earle drawl. By the time the understated music rises and becomes a huge, crashing world of distorted goodness, there’s more in common with The End Men than anything country, but with the volume cranked accordingly, it’s very easy to get swept up in CNC’s ominous world of low-lifes and ravaged characters. The finest example of the garage rockabilly style, ‘Faster Baby Punks! Kill! Kill!’ begins with more country pickin’, before increasing volume, adding bluesy guitars before the chorus – an absolutely savage musical attack – thunders at breakneck speed with the title shouted for effect. There mightn’t be a rattling upright bass, there mightn’t be too much tousled hair, but these guys could take on everyone when it comes to these distinctive sounds. Going for the even more basic, the demo quality ‘Honey, We’ve Got Some Bad Blood’ serves up raw blues and heavily treated vocals in an unrelenting backporch stomper, while ‘Eraser’ retreats to CNC’s trademark blend of honky-tonk business but tops it with a distinctly angry vocal and ‘Delta 88’ goes for more finger-picked goodness as the perfect backdrop to a very natural voice. 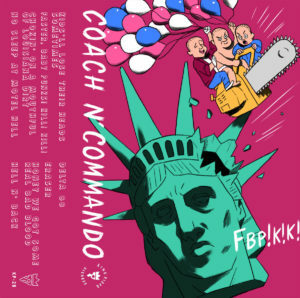 While each isn’t necessarily among ‘FBP!K!K!’s strongest material, these are tracks that help paint a much clearer picture of the experiences and places which spark CNC’s imagination and spawn their truest musical intents. Yeah, it’s ugly and sometimes confrontational, but this is also hugely entertaining. With sharp edges, country-folk pickin’, garage rock distortin’ and a whole world of vocal grumblin’ that comes up trumps almost every time, ‘FBP!K!K!’ scores with a dust-eatin’, throat punchin’ attitude that’s just impossible to ignore. This entry was posted in Album & EP Reviews and tagged blues, cassette, garage, king pizza records, noise rock, stream by Real Gone. Bookmark the permalink.